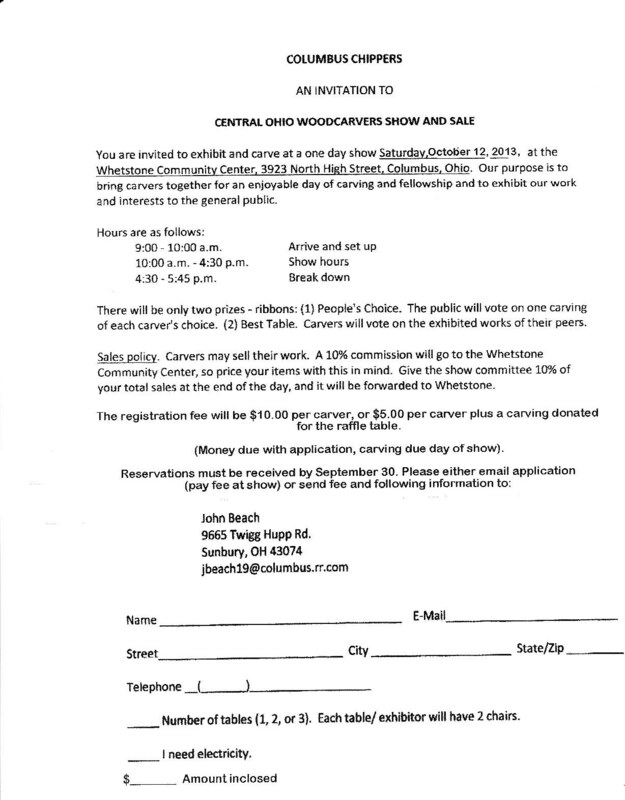 Once again the Columbus Chippers Woodcarving Club is hosting a one day wood carving show and sale. The show will be held at the WhetstoneCommunity Center (entrance to the Whetstone Park of Roses), 3923 North High Street, Columbus, Oh. We are looking for wood carvers who would like to exhibit in our show. If you or any members of your club would like to join us for the one day show, we would appreciate having you join us. I have attached a copy of the show application. It should answer most of your questions. If not, you can either call me or e-mail me at the addresses below. I do apologize for not informing you sooner, but the summer went by just to fast. Maybe it?s my age, or something. If you are no longer a member of your club, or are no longer active in carving, please pass this to the appropriate person or persons who can use this information. My list is not up to date, so I must apologize again if this reaches you in error. This entry was posted on September 9, 2013 at 3:35 pm and is filed under Woodcarving. You can follow any responses to this entry through the RSS 2.0 feed. You can leave a response, or trackback from your own site.